They say all good things must come to an end, and the HM3 has certainly been good for Max Busser and Friends. This will be the Final Edition of the Jean-Marc Wiederrecht / Agenhor reengineered version of the veritable HM3, dubbed the MEGAWIND. 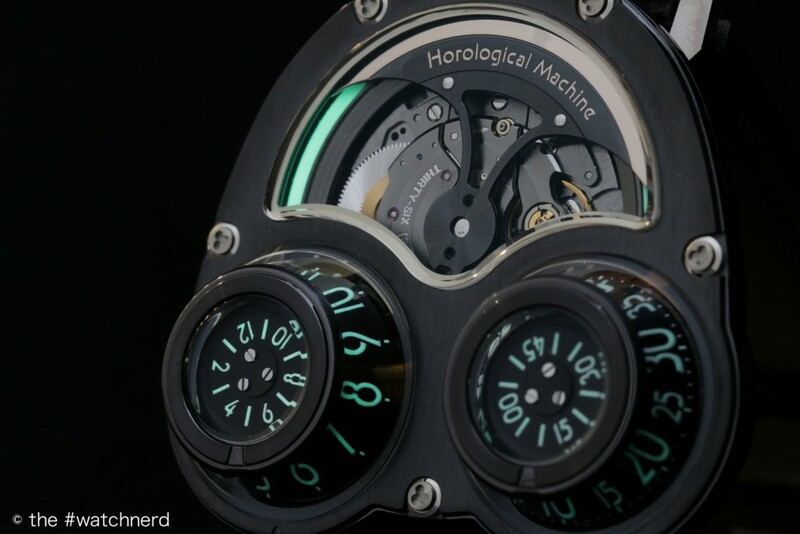 We’ve already seen more versions of the HM3, HM3 Frog and HM3 MEGAWIND than any other Horological Machine. 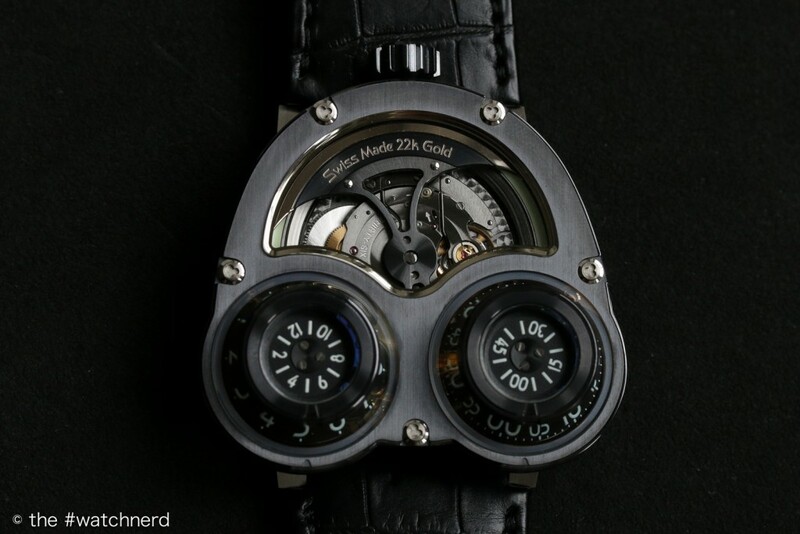 Indeed, in the tenth year of MB&F’s increasingly interesting existence, it’s fitting to pay tribute to a family of watches that represents almost thirty per cent of the total number of MB&F watches ever produced. 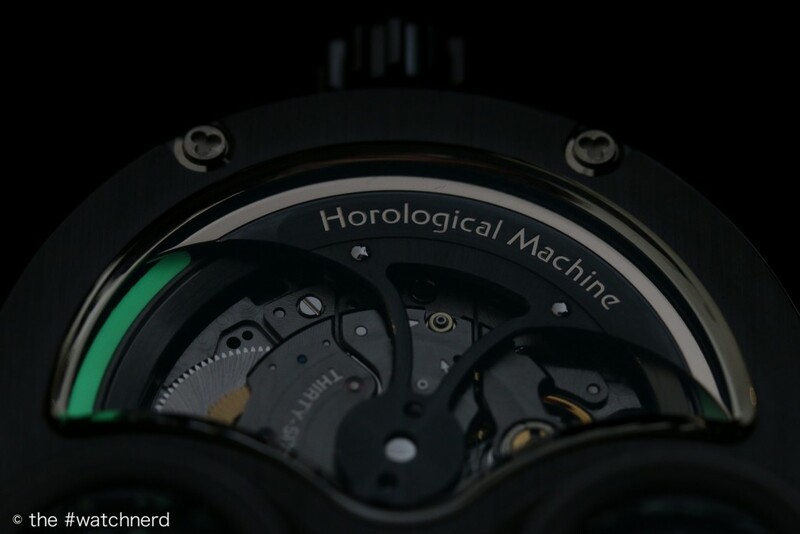 We’ve witnessed collaborations with Stepan Sarpaneva (the MOONMACHINE**) and Boucheron (the JWLRYMACHINE), a model based on the Dendrobatidae family (the Poison Dart Frog) and many others (the Sidewinder and Starcruiser spring immediately to mind). In total, nineteen different references were produced, with four different movements being used. This latest and last version of the MEGAWIND sports a dark PVD’d 18k gold case and accompanies it with lume. 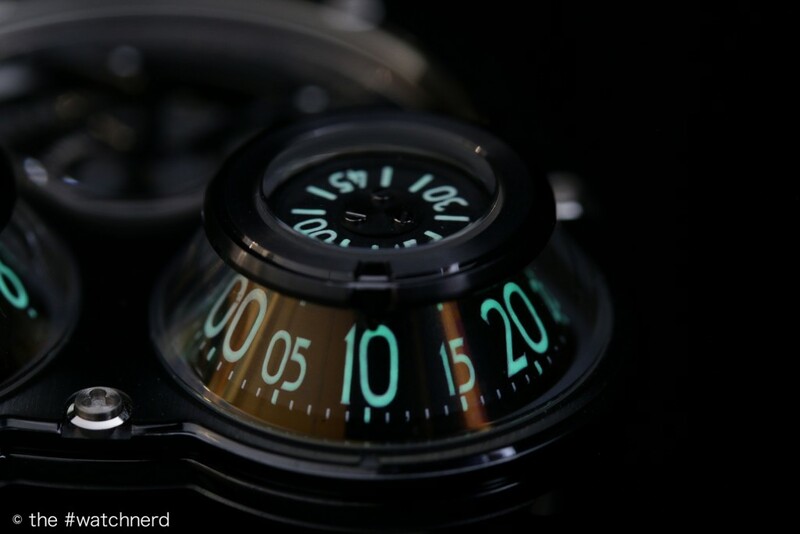 Lots of lume – C3 Super-LumiNova, that slightly yellowy version of the high performance phosphorescent pigment. There’s even a glowing ring under the blackened 22k gold winding rotor that strobes as the axe-shaped Sowind oscillator spins. It may as well have been called the HM3 BlackBadger. I was wondering how you apply luminescent material to a curved surface like those on the Final Edition’s aluminium cones, so I asked Charris Yadigaroglou. The solution is deceptively straightforward – you print a conic dial in exactly the same way as you’d print most other dials – using a pad; it’s the template that needs to change. When you represent a three-dimensional object in two dimensions you need to project it onto the new surface. The Mercator projection, for example, is probably the most famous method of representing a globe as a cylinder. The Transverse Mercator does something similar with ellipsoids. The numerals are cut out of the projection, applied to the ink and a pad is used to print an initial white layer on the cones. Each of these numbers on the hours and minutes dials is then hand-painted with a thick layer of C3 Swiss Super-LumiNova (MB&F credit Frédéric Thierry / Monyco). To see the HM3 Megawind Final Edition in action, head over to my Instagram account, where I’ve posted a video of the beautiful 22K gold spinning rotor in action. The Final Edition will be limited to just 25 pieces, and available to purchase at 84k CHF. Tempting, isn’t it? So long, HM3, it’s been fun. Shine on. ** On a personal note, the MOONMACHINE is probably my favourite of the HM3 variations – that titanium version with white gold moon against a light blue sky really is astoundingly good.